Worried you might be falling into 'The Debt Trap'? Our latest report, carried out alongside The Children’s Society, reveals that two and a half million children are living in families with debt problems, and another five million are in households that are struggling to keep up. 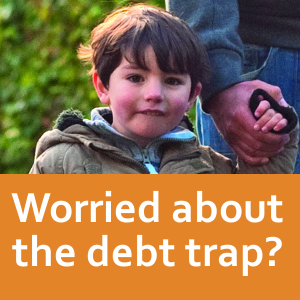 The Debt Trap report shows how much pressure there is on families to make ends meet. We know there are parents up and down the country who are facing tough decisions about how to cope with financial pressures; whether to warm their house or feed their kids, cover the credit card bill or pay for school uniforms. What is the debt trap? Many parents feel that using credit is the only option they have to maintain an adequate standard of living for their children. However, the cost of keeping up with credit repayments places further pressure on household budgets. Many of the people we speak to get stuck in this trap. I’m worried about the debt trap, what can I do? Being able to plan a simple household budget is a skill that can save you thousands of pounds over the course of your life. It’s not complicated but it makes a genuine difference. All you need to do is create a list of your money coming in and going out in a month. When you’ve got these figures down you can then add them up to see if you’re able to cover all your costs. Once you’ve got a budget in place you’ll be able to look at your list of outgoings and see what your money is spent on. If you’re spending money on something you don’t need to then you can cut it out. If there’s something you need but could get a better deal on then shop around and see if you can save money. I’ve heard people say that it’s not worth bothering saving a few quid here and there, but it’s those little changes that add up to make a huge difference in the long run. Someone I spoke to a while ago got rid of their Sky TV package, and the monthly saving meant he was able to get out of debt 18 months sooner. Every year around £10 billion in welfare benefits goes unclaimed. You might be entitled to some of this money that isn’t being claimed. The easiest way to make sure that you’re not losing out is to try our free online welfare benefits checker. It’ll tell you what you’re entitled to claim, how much you should be receiving in benefits, and which forms you need to fill out. If you’re in a situation where you can’t pay everyone then it’s important to make sure your money goes to the most important areas. This doesn’t mean paying the people who’ll shout the loudest if you miss a payment. The most important thing is to pay for the things you need the most. This will usually mean making sure you’ve got food to eat, a roof over your head and the utility bills covered. Think like a caveman; we need food, shelter and warmth above all other things. The first four tips are often enough to solve money troubles but sometimes the problem is deeper than making a few changes. If you’ve tried to sort out your debt problem yourself and are still struggling then you should look to get expert help. That’s where we come in. We can help you work out the best way to deal with your debts and we’ll show you the ways to break out of the debt trap. Either way we’ll help you find the best solution and show you how to get out of debt.